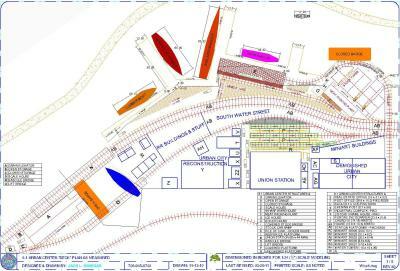 Plan-Sets offered to construct a Waterfront complex. Barges could be found around navigable waterways 100 years ago and at marine terminals today. 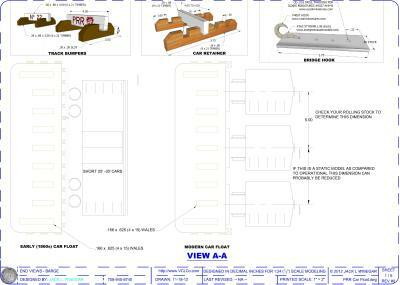 1:24 scale Plan-Sets include printing and dimension Scale Conversions.pdf factors to 22 popular scales. Barge - NYC Open ​•••• In the early part of the 20th century railroads were transportation companies operating Tugs and Barges along with their trains. The New York Central had 139 barges in their fleet in 1949. Open barges would carry; coal, grain, gravel, salt, sand, stone, and mulch such as wood chips etc. Scrap iron to scrap yards and steel mills. 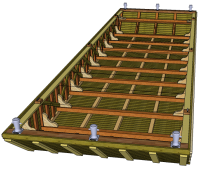 Construction illustrates how to build this barge plank by plank just as they were built 100 years ago, for indoor or outdoor railroad gardens. Footprint 50" x 15". $12 Plan-Set​ •••• includes; 5) 13" x 19" super B drawings, with full size hull templates and a material list for the finescale modeler. 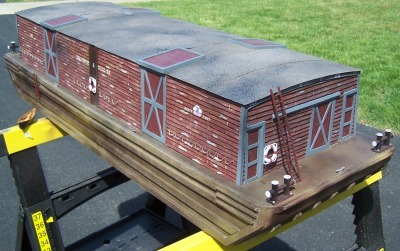 Barge - PRR Car Float ​•••• A railroad Car Float or Rail Barge is a barge with rail tracks mounted on its deck. It is used to move railroad cars across water pushed by a Tugboat or towed by a Towboat. As such, the car float is a specialized form of a train ferry. Car Float service was provided by more the 10 railroads at pier stations and waterfront warehouse facilities around 1900. 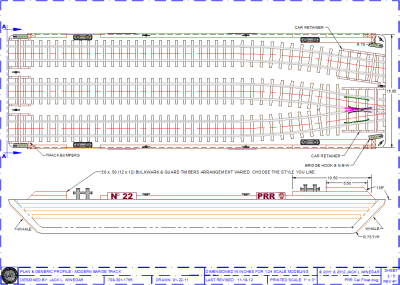 This Pennsylvania Railroad Plan-Set gives the option of 3 track configurations depending on the era you model. Bridges and truck service eventually eliminated the need for Car Floats. 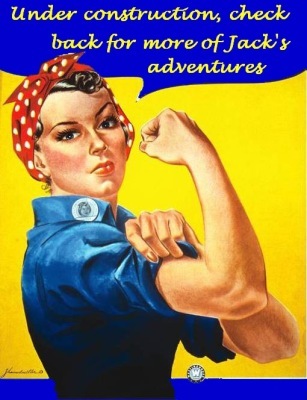 Though such service is still available in NY. NY. Footprint 50" x 15". $12 Plan-Set​ •••• includes; 5) 13" x 19" super B drawings, with full size hull templates and a material list for the finescale modeler. Construction illustrates epoxied impregnated wood and acceptable woods for Railroad Gardens. Barge - B&O Covered ​•••• Also referred to as a House Barge. The B&O still had a total of 64 barges in their fleet in 1949. Covered barges hauled people (many people were afraid to ride Steam Boats in the early days due to many boiler explosions), lumber & construction materials, oil, ice, livestock and other perishable freight that required sheltered transportation. As with most Covered Barges this Plan-Set shows a Captains Quarters where his family also lived. Footprint 50" x 15". $14 Plan-Set​ •••• includes; 7) 13" x 19" super B drawings, with full size hull templates and a material list for the finescale modeler. 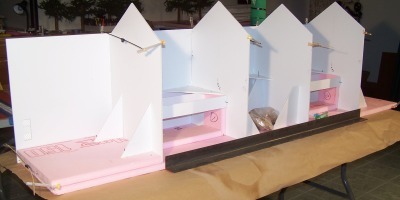 Foam Core Board construction is illustrated for indoor or outdoor railroad gardens. 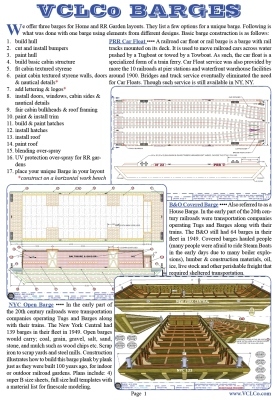 $33 Plan-Set & Barge Booklet​ •••• Plan-Set includes; 17) 13" x 19" super B drawings, with full size hull templates and a material list for the finescale modeler. Foam Core Board construction is illustrated for indoor or outdoor railroad gardens. Spiral bound Booklet consists of; 17) 9½" x 13" pages. 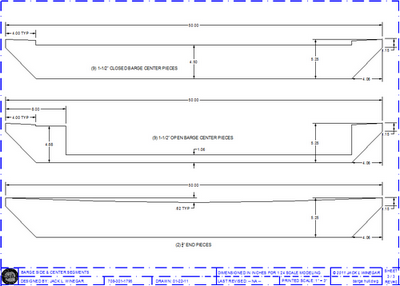 1:24 scale Plan-Sets include printing and dimension conversion factors to other popular scales. Warehouse -Three (3) Story​​ ​•••• Large warehouses have always been found in an urban environment. 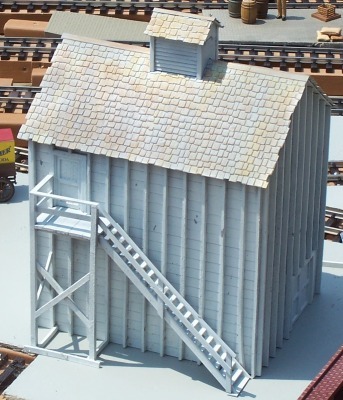 End doors are large enough for trains to enter for operations or use this structure for storing trains in a RR Garden. This warehouse could be built with as many stories as you have room for. 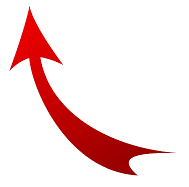 The length can also be modified by increasing or reducing the number of bays. Footprint as designed is 80ʺ x 15ʺ. $16 Plan-Set & Spiral Bound Booklet​ •••• Plan-Set includes; 6) 13" x 19" super B drawings. Foam Core Board construction is illustrated for indoor or outdoor Railroad Gardens. Spiral bound Booklet consists of; 16) 9½" x 13" pages, which include 3-D illustrated construction renderings and photos, adhesives, painting, UV stabilization and weathering instructions. Wharf Vignette designed by the VCLCo is located at the Taltree Arboretum & Gardens in Valparaiso, Indiana. Slaughterhouse was built by William Test. Another RR spur is located behind the plant for shipping the meat products in Reefers to markets across the country after Packing. This 3-Story Factory was originally built with a masonry power house and a clock tower. Clock Towers were designed into many large factories so employees could see what time it was from a distant, and get to work on time for a 10-hour work day! 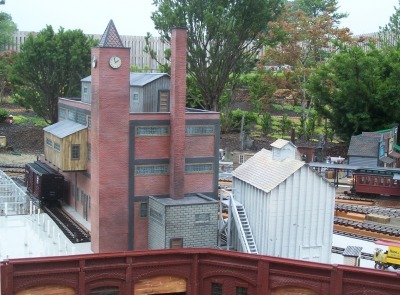 This factory had many additions over the years which include; a bridge, a lean-to, an office building, and a penthouse that can or not built by the modeler. Footprint as designed is 68ʺ x 19ʺ. $23 Plan-Set & Spiral Bound Booklet​ •••• includes; 9) 13" x 19" super B drawings. Foam Core Board construction with textured styrene is illustrated for indoor or outdoor railroad gardens. Spiral bound Booklet consists of; 17) 9½" x 13" pages, which include 3-D illustrated construction renderings and photos, adhesives, painting, UV stabilization and weathering instructions when modeling with Foam Core Board. Ice House with Icing Platform •••• This is a freelance stand-alone building which can be use with the “Three Story Generic Factory” to supply ice for reefers shipping products across the continent. Also included on the Plan-Set is an Ice Platform. Ice houses were found near a water supply where the ice could be cut into blocks in the winter. Since this was before “refrigeration” the insulating values of Ice House walls was very important. Studs were placed on the outside of walls because studs don’t have the insulating value of the state of the art insulation of the day, "saw dust". Also note; no windows, small doors and a cupola to let summer heat out. Footprint is 9½ʺ x 12ʺ with a 27ʺ long Icing Platform. $11 Plan-Set​ •••• includes; 6) 13" x 19" super B drawings. 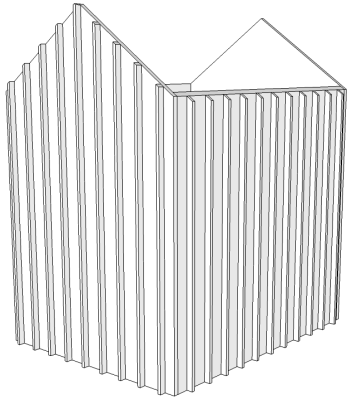 Foam Core Board construction with textured styrene and a Bill of Material and a 3-D construction rendering are shown. Wharf Area Footprint Plan-Sheet​​ •••• includes; Boats, Lumber Yards, Packing Plant, Piers, Ramp, Stockyards, Grain Elevator, RR Terminal, Urban Street Buildings, and a Warehouse. Footprint Plan-Sheet is a 13" x 19" super B size drawing. Wharf as built construction drawing Plan-Set​​ •••• includes; Boats, Lumber Yards, Packing Plant, Piers, Ramp, Stockyards, Grain Elevator, RR Terminal, Urban Street Buildings, and a Warehouse.